May 1, 2007. 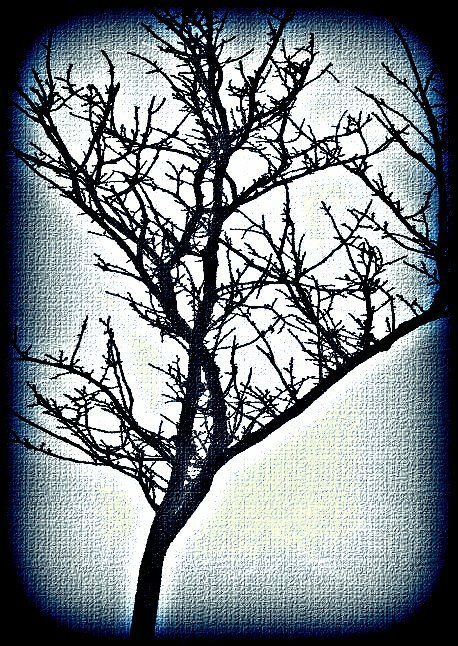 I moved, like a sloth, through the blackened branches in my mind, away from the moon, down the trunk, and onto the charred floor. I drifted on a current of air, whirling along with the debris that was everywhere inside me. The fall out—noise and dust—from the destruction was burying my heart. Deeper I went, until I found my way inside the familiar chamber. On my knees then, I lifted the trap door, dropped through the hatchway and sank into the inner room, the heart of my soul. I closed the door above me to shut out the incomprehensible sounds that raged on inside me. No more noise, no more dust, no thought, no feeling; just thick, black quiet. There had been, before, at least a small light source, a candle flame, in this hidden place. But now, there was only black. With my hands, I searched for something solid. His empty bed. I lay down and pulled his colorful blanket to my chest, balled it up and buried my face in it. Sammy…I’m here. I heard crying. Somewhere out in the whirling blackness a wolf, or its cub, was howling. It was his first night alone and away from his litter-mates. The tiny dog was wailing. “Great. He’ll cry all night, every night,” David regretted the purchase. “Then he’ll start barking. This was a huge mistake.” We lay in bed listening to the four pound werewolf cry; cursing the gift we, or I, had chosen. When Sam ran into our room in a panic, his eyes huge with fear (so far the dog was not helping his heart). He jumped in our bed. “Daddy! There’s a wolf in the house! Don’t you hear it? Listen.” Tiny howls came from the other end of the house. We told him everything was okay. “But, the wolf! You hear it? Listen.” The surprise was blown. “Come with us, we’ll show you what the noise is,” I said. “It’s not a wolf, so don’t be afraid. There’s nothing to be afraid of.” We held hands and walked to the kitchen. The sounds grew louder but less scary, then stopped. Our voices hushed the tiny beast. “What is it? !” Sam asked. On his knees, he looked into the crate at the small brown eyes staring back. “Is it a puppy?” He was unsure. 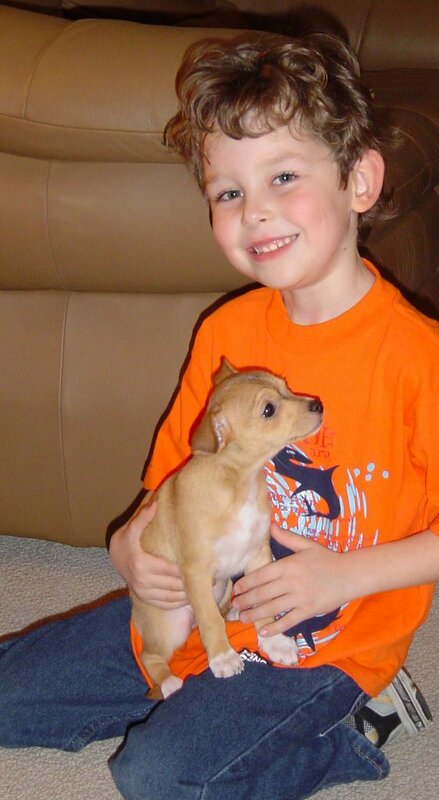 “Your puppy Sammy. He’s for you, he’s your Christmas present,” I explained. “You want him to sleep in your bed?” I asked. Sam’s answer squealed out of him. “Yes! Right. He needs to sleep in my bed. With me. In my bed, okay? I’ll take care of him!” He clapped his hands and hopped all the way down the hall back to his room. Sam jumped into bed. “Yes! Okay! Here! Put him right here—next to my pillow,” he directed. The puppy poked his nose through the cage door and Sam laid his head an inch from it. The two slept nose to nose. There was no more howling from that day on. Both dog and boy were so completely satisfied, and safe. Together, comforted by each other’s breath and warmth. All night, I lay with my eyes open, staring at every last minute of him. Hearing the howling, the crying, the shouting, the sirens…dying, waiting for my heart to stop and my eyes to close. But the firestorm inside me grew as the black night turned into gray morning. Sammy, I have to go. 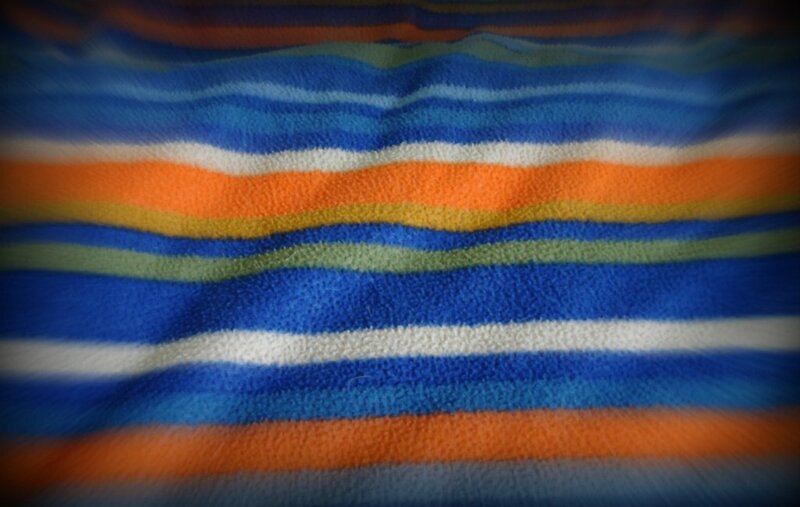 I smoothed out the stripes in his blanket. I’ll be back. Before sunrise, I left my empty soul, went up through the hatch and out of my heart, through the debris that was everywhere, and then out of my mind. I don’t remember the in-between moments: when people arrived; who poured the milk in Joey’s cereal; how I moved, breathed, or got ready to go to a funeral home…. They’ve all been swept away. But, the few things I do remember are stuck to the stem of my brain like receipts on a spike. Phone calls were made and appointments were set. Loved ones and friends—all from other cities and states—were driving or flying in to be with us, and would arrive this day and the next. I don’t remember when David’s father, Sandy, and his partner, Doris, arrived. But they were there, with Joey, when David and I left for the funeral home. We were crash-test dummies, hurling through space. Blank-faced puppets that walked, talked, and even drove. We pulled up to the funeral home, stumbled to the entrance, and stepped inside. It was quiet, clean. A place after hope, where bodies without minds go to make impenetrable decisions. Sam was still in the hospital, alone; his body having open heart surgery, a cardiac autopsy that I’d consented to. Yesterday? “Will I ever need surgery?” he’d asked me once, insisting his only fear was of needles. Without hesitation, trying to sound nonchalant, I told him, “any one of us may need surgery at some point in our lives. So…maybe…probably not…or, possibly never.” But he knew my heart, the way I knew his. Our souls shared their secrets. I love you Mommy. Don’t give up. I won’t, Sammy. I won’t give up. I told him I was afraid of needles too. David and I were led to a small room and ushered inside. The walls were buttery, too bright; and spotlit on them were paintings that suggested heavenly peace. A pale love seat was on one side of the room, and two leather chairs floated before a large, polished desk. But there were no scattered notes, files, paper clips, or other clues that business was conducted on the mahogany surface. We sat in the leather chairs, cold and stiff. At once, like in a nonsensical dream, I was somewhere else. September 18, 1997. Again, David and I were sitting in stiff chairs before a large desk. A genetic counselor was discussing test results with us. Sam was not there, but he was there—beneath the surface. A small and palpable, eighteen-week-old lopsided lump in my belly. An un-round shape that bulged and moved, stretched, hiccuped, and pushed—with a foot, an elbow, a fist? And when I played music, he really moved. His name wasn’t Samuel, yet. It might have been Nolan, after Nolan Ryan, or Grey, Daniel, Reese, James or Joseph. But while I’d been dreaming about his future, and a name that would fit it, a routine prenatal blood test indicated that something was wrong. I signed a disclaimer for yet another test, an amniocentesis. We would invade his safe space with an over-sized needle, steal milliliters of amniotic fluid, and glean un-seeable genetic threads for answers. I prepared myself, for what, I didn’t know; but I would protect him, my lopsided lump, and I told him so. I was scared, and so…he was too. When the doctor held up the huge needle, I turned my head and tried to focus on the television screen, from which the tiny soul inside me appeared to be waving, his tiny hand quivering. The needle pierced my belly and came dangerously close to the quivering hand, and the tiny soul seemed to gasp with alarm. Bubbles burst from his mouth. I did not take my eyes off him. You’re okay. You’re fine. I’m here. It’s okay. We’re almost done. I tried to message him, through some mother-child telepathy, as I watched his squirming image on the TV monitor. A few weeks later, David and I sat in the geneticist’s office to discuss the test results—a report card with 46 grades, his chromosomes. Did he pass? Of course, he’s brilliant! I thought. The genetic counselor laid the proof out before us and spun it around on her desk for us to read. She pointed to 23 stringy couples, curled and twisted micro-maps with genetic stories folded inside. Mystery novels. But we saw only the bindings of the 23 novels, their spines, and not the scripture inside—that was unreadable. We judged the books by their covers—the 22 duos plus 1-XY pair. A boy! “Nothing missing, nothing extra,” the counselor said. The hidden pages, with billions of letters and seemingly unending paths of plot twists, would unfold and play out as he lived. “I’m not a betting man,” my doctor said, in a follow-up appointment, “but if I were, I’d bet on odds that the baby will be fine. All of us are gonna get something one day…colon cancer maybe? These tests just give us odds, probabilities. We’ve ruled out Down’s, so…should be fine,” he said as he left, closing the door to further questions or conversation. I stared out the window; eleven stories below, busy cars, like ants, were hurrying to go nowhere. The examination room was claustrophobic. One day…? Should be…? The remarks seemed flippant, and did not undo my fear. But the word “fine” was good—right? Yes. My baby would be a fine baby, with fine downy hair, a fine mind, and he would grow up to be a fine man. Maybe, when he grew very old, this fine man, he would develop colon cancer. But there would be a cure for that then. And he would have lived a fine life. Nonsensical dreamtime changed again. We were back, sitting in the buttery office, in the funeral home. Kim and Dave C were nodding at us from the pale love seat, beneath the heavenly artwork. We’re here, in case you need us. Had they been there all along? Like other in-between moments, friends, places, gestures, and conversations sometimes materialize in my memory, like the reflection of sunlight on fishes’ scales, but then vanish again into deeper, murkier waters. When the funeral director joined us, he sat behind the polished desk, introduced himself in a subdued manner, and apologized for our loss in a soothing tone. He laid a glossy booklet, full of empty coffins, before us, and gently slid it across the desktop for us to see. He pointed out two—three?—choices he thought we might approve of. “Simple not ornate,” David said, and I nodded (or I said it, and David nodded). I don’t recall our answer, only our heads bobbing like marionettes. How hideous—wrong! That I had asked my child which casket…the way I’d asked him to choose gift ideas from holiday catalogues. Where he’d drawn bright blue Sharpie circles around the toys he’d wished for—action figures, secret spy supplies, army tanks, and magic kits. And now? There weren’t even child-sized coffins in this book. Sammy… I’m sorry…. There were only large, adult-sized, or tiny, baby-sized. Because children aren’t supposed to die! Sick babies do die…in tiny caskets. And big-people certainly die…in big people caskets—when they’re old and sick. Mommy, it’s okay. Daddy, we’ll take that one—with the Star of David, and that blue blanket on top. The blanket was the color of his Sharpie circles. He was there, beneath the surface, between our chairs. I felt him, his soft cheek on my shoulder. I could smell him, traces of him in the air. It was perceptible, palpable even. And I heard him. David heard him too. As long as we focused on him, we could walk, talk, and make decisions for twisted minutes in time. We left with our assignment: write Sam’s life on a single page. The words were ridiculous. “Passed away? He lived? He loved?” No, NO! He still lives! He still loves! Give him back! Let him live! Please! PLEASE! Let me keep him! He’s mine! Give him back! My pleads mixed with the crying, the shouting, the sirens, the howling winds that raged inside me. A motionless shell on the surface, but swatting, screaming, kicking, frantic on the inside. So far away that no one could see or hear me—my heart beating in the tornado, arms flailing, running, scraping…the trap door slamming, withdrawing into the silent black of my soul. In the muffled darkness, a breeze stirred. A distant flash of light, a firefly, or the lighting of a match, lit the walls around me. Embers flickering to life became a border of cave drawings against a wild sky. Spirited animals jumped and danced on the walls of my memory. Yellow-green painted palm trees swayed, and sounded like pages turning, or bed linens—open parachutes—rustling before landing on their beds. The scent of chocolate cupcakes, the outdoors still in his hair, the sweetness on his breath…all of it too real to be only a memory. Time was bending back so I could die with him, here. In our house on Beauclerc Oaks Drive, March 23, 2000. We’d had a “big boy” party to celebrate Sam’s passage out of the crib and into his new “big boy” room. He was two, and I was pregnant with his little brother, who would arrive soon. We’d had a very busy day and we were very tired. It was time for a story—and rest. 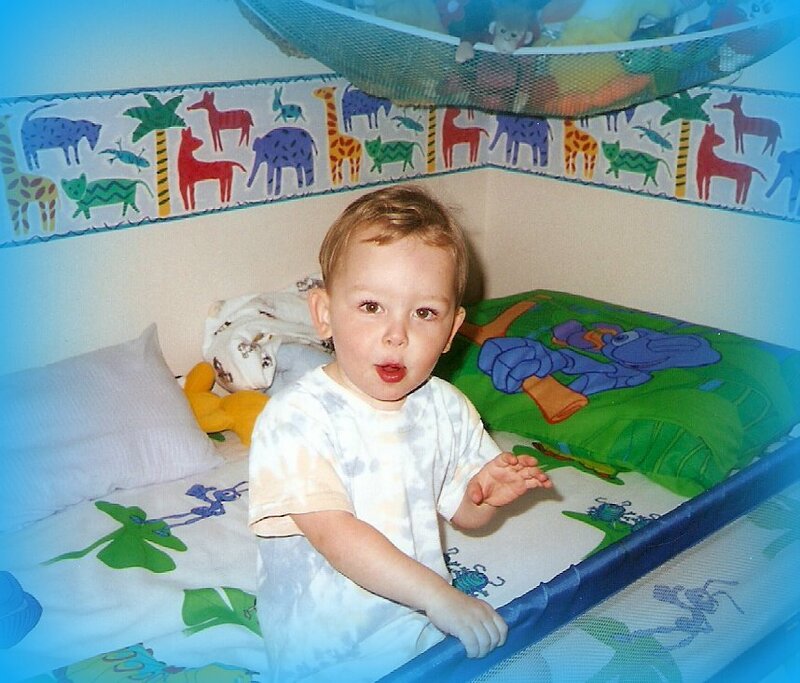 Sam climbed onto his big boy bed, into the movie themed sheets, A Bug’s Life, and examined the colors, antennae, and eyes that were popping from everywhere. Smiling. I lay down beside him. The bed rail, with the blue nylon netting, would’ve been up to keep the dreamer from falling; but this time, I was his safety net. We snuggled in with our favorite book. He nestled my shoulder and held his blanket to his cheek, and his excited eyes focused on the book’s cover. “Sam and the Firefly, by P.D. Eastman,” I announced, and pointed out, “Those big red letters, S-A-M, spell Sam. And it is night. And the moon is a full yellow. Hmm…is Sam an owl?” I asked. And he giggled at the question, because the answer could have been yes or no. “Yes,” he said, then pointed to the firefly. “Gus,” he smiled. He already knew their names and all the words in the book. On the inside cover, SAM, the owl, was holding up the pointer of his left wing. “He looks like he’s scolding Gus, doesn’t he?” I said. The owl’s eyebrows were drawn high in upside down smiles over his wide yellow eyes. Sam studied SAM and mimicked his expression. And I began to read. A talking light hit SAM on his head! A firefly, named Gus, showed SAM tricks he could do and lines he could make with his light. SAM was enthralled with the tricks Gus could do. My boy reached out, touched the page, and traced the light’s lines with his magic finger. He yawned and smiled while Gus and SAM spent the night making words out of light. His eyes grew heavy. His thick lashes fluttered like a moth’s wings, opened, then closed. Asleep. I lay the book between us, in the space warmed by our breath, and closed my eyes. We’d animated SAM’s story, and traced Gus’s flights, and laughed at the friendship between a bug and a bird. But at the end we didn’t applaud. Our muscles, too relaxed; our eyelids, too heavy. Face to face, eyelash to eyelash, we slept, and entered the story in our dreams.